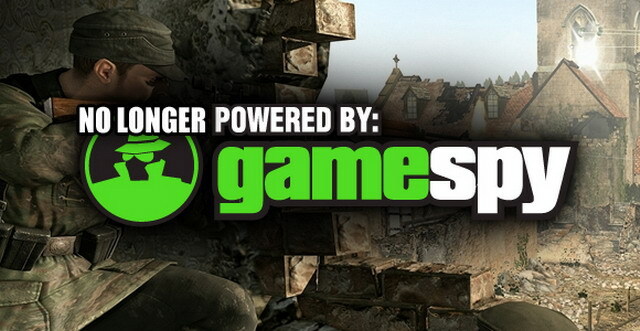 Some of you may recall the announcement of GameSpy's imminent closure back in April. Since then, subsequent information has been released regarding the fates of some games. Back in the glory days, a player would play a game x amount of times over until they got bored of it. Perhaps, the gamer would then switch to another title and return to the firstly mentioned game sometime down the road. In today’s day and age, gamers need to play certain aspects of games just in case they are no longer supported later in time. The aspects I am referring to have to do with online multiplayer game modes. It is no stretch to say that with some games, the online multiplayer is a key factor in experiencing the full value of the game itself. Taking the Command & Conquer series as an example, it is fun to play matches against bots, but it does not stack up to the real challenge of another human in an online match. Not to mention, there are plenty of games where multiplayer modes are strictly online with no local functionality. If servers are shut down for games lacking in any local multiplayer, the player can no longer play multiplayer gametypes whatsoever, thus losing a major factor of the game. Unfortunately, EA just announced yesterday that it will be shutting down the servers of about 50 of their games on June 30th, 2014. Evidently though, EA had been considering having community-run servers for various titles. Quoting them, “We know some of these games are still fan favorites, including Battlefield 2, Battlefield 1942, Medal of Honor: Allied Assault and Command & Conquer games. We are still investigating community-supported options to preserve online functionality for these titles, such as multiplayer. Significant technical hurdles remain, and at this time we don’t have anything to announce.” Although EA’s words had seen hopeful, in the end, some things just do not work out the way some of us would hope for it seems. I have included the list of games that are to have their servers shut down below (you'll notice my tear drops near of the games that affect me directly). Some titles are not really notable as “fan-favorites," however, there are definitely games in the list that are worthy of the aforementioned title. The latest news on this matter is that EA is in fact still investigating various community-supported options for some titles, but officially, there have been no notes of specific plans thus far.